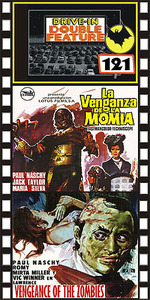 THE MUMMY’S REVENGE (1973) Paul Naschy, Jack Taylor, Maria Silva, Helga Line. An evil pharaoh and his queen slash the throats of young girls and drink their blood. They are mummified alive for their grisly crimes. Years later, a scientist disturbs their tomb. Chills soon follow! Paul really got wrapped up in his performance in this film. Color, 16mm. VENGEANCE OF THE ZOMBIES (1972) Paul Naschy, Vic Winner. This is one of the more graphic and brutal of the Paul Naschy films to come out of the ‘70s. A British woman has nightmares in which she sees her friends horribly murdered. Soon it begins to happen in real life. She discovers her family inherited an ancient curse. Featured are all kinds of weird and gruesome zombies and zombie rites. Color, from 16mm.